Names in italics indicate rulers who were usurpers or not widely recognized. ^ Also claimed the Solomonic lineage through his mother. ^ Previously King of Shewa from 1855 to 1856, and from 1865 to 1889. 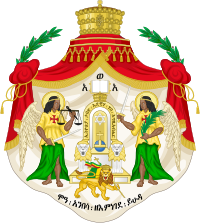 Ruled under the regency of Ras Betwoded Tessema Nadew from 1909 to 1911 and Lij Iyasu from 1911 to 1913. ^ Never officially crowned as Emperor. Deposed by nobility with the sanction of the Church. ^ Ruled under the regency of Ras Tafari Makonnen (future Emperor Haile Selassie I). ^ De facto ruler of the country as regent from 1916 to 1930. Crowned as King in 1928. ^ Unrecognized only by the United States and Soviet Union in 1940. Renounced title in 1943. ^ Briefly deposed during the 1960 coup attempt. ^ Proclaimed Emperor by the Imperial Guards during the 1960 coup attempt. ^ Designated "King" (not Emperor) by the Derg while out of the country, did not take throne.